and at eighteen graduated from Brown University. 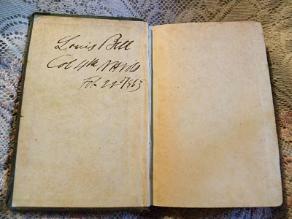 1860 and a son, Louis, born December 5, 1864.
however, did a large amount of guard duty. ’61; must. in May 1, ’61, as Capt. ; must. out Aug. 9, ’61. boot on which was a spur. — Manchester Mirror, 1st inst. 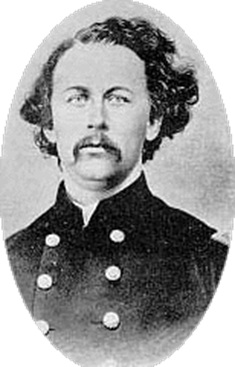 command of Colonel, Fourth New Hampshire Regiment on March 18, 1862.
proclaim himself an abolitionist in his defense to the people of New Hampshire. General Brannan succeeded General Hunter, and immediately restored Col. Bell to his command. dock he was greeted with round upon round of enthusiastic cheers. foothold on the mainland. Col Bell was wounded in this action. 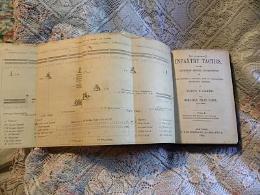 sieges of Forts Wagner and Gregg on Morris Island and Fort Sumter, Charleston, South Carolina..
years, for a thirty days furlough. charge on Fort Gillmore (New Market Heights) September 29, but forty men were fit for duty. town from June to December 1864 .
operations June 30 and July 30.
treated the matter with the utmost indifferences. to Col. Bell. In all other cases the officers have furnished their own unfit. Col. Bell gave Ex-Gov. the State authorities to pay this bill, but has given no attention to the same. such proceedings against them as in their opinion will most quickly insure a speedy payment. the brigade in line as well as I could do it under the severe fire, holding one regiment in reserve. almost enfilading my line from both right and left. Before Richmond, Va., October 3, 1864.
from the 28th day of September to October 1, 1864. Brigade. The distance to the fort was over half a mile, across three ravines, filled with fallen trees. front. During the day I advanced my picket-line. Casualties, 4. Actg. Asst. Adjt. General, Second Division, Tenth Army Corps. Near Richmond, October 29, 1864.
of the Ninth Maine Volunteers. lines my command acted as rear guard. Total number of casualties killed and wounded: Killed, 8; wounded, 58. Colonel Fourth New Hampshire Volunteers, Commanding Brigade. Carolina. A second expedition against Fort Fisher resulted in the fort’s capture on January 15, 1865. 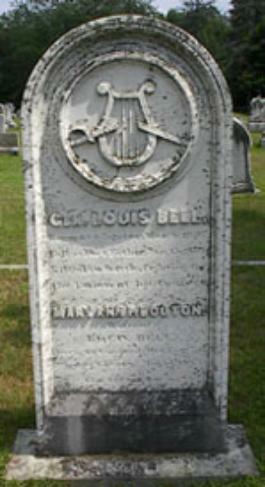 During the battle, Col. Bell was mortally wounded and died January 16, 1865.
months after her husband’s body was brought home. magazine, which suddenly exploded, adding frightful causalities. in a glorious victory, a martyr to the holy cause of Liberty and Union. thoughts and heroic acts; and when time with us shall fade away, may we meet him above. acceding to the colonelcy upon the resignation of Colonel Whipple, in March 1862. Holding this rank, he commanded the post of St. Augustine in 1862, and was temporarily in command of a division of one of General Butler’s corps of the Army of the James, in one of the Deep Bottom fights of the past summer when our forces occupied the north bank of that introductory water course to Richmond. The wound causing General Bell’s death was the sixth one received by him since his entrance upon the service. The deceased general was a son of the late Governor Samuel Bell, of New Hampshire, and a nephew of the late Governor and Senator of the United States, John Bell, of same State. He was also a brother of Chief Justice Bell, of the same State, as well as Hon. James Bell, late United States Senator from New Hampshire. General Bell graduated at Brown University, Rhode Island, in the class of 1853, and was distinguished on commencement day, as afterwards, for his talents in chemistry, both natural and applied, as well as for the natural sciences generally. He was also well read in the science and instruction of the law, and at one time, just previous to the commencement of the war, held the position of solicitor for Stafford county in his native State–an eminent position. Charleston harbor, under General Gillmore. wife and two little children. age, as it has been without equal in the past history of military prowess. flowers on her husband’s grave. Mrs. Bell was a daughter of Rev. Dr. Bouton, of Concord.